The Forest Grove college's Jimmy Calhoun finds salvation in wrestling at the age of 28. It's June 2018. A 27-year-old Jimmy Calhoun, just months removed from a six-year stint in the Air Force, sits alone in his parked car at an abandoned gravel pit in rural northern Washington. After ingesting what he believes to be a lethal combination of oxycodone and heroin, the former wrestler, soldier, and relatively straight-laced kid from Kendall, Wash., shakes uncontrollably in fear that his life is over. He has no money, no cell service to call for help, and very little hope that he'll make it through the day. "At that point, everything starts to flash before you," Calhoun said. "I realized, here I was, six months out of the military, and I was about to die of an overdose." Jimmy Calhoun was a typical kid. Born and raised in Kendall, a city of roughly 200 people, he played soccer and a little basketball, and when he turned 8, he started wrestling. He didn't like it at first, and in fact, by his own admission, he wasn't particularly good. But what drew him to the sport was what Calhoun would tell you drew most kids from low-income, blue-collar towns like Kendall to it: the accessibility. "Wrestling accepted anyone," Calhoun said. "There's a place for you, and that's why we stuck with it. If you're not any good, it's in your hands to get better, and I always liked that about the sport." By middle school, Calhoun had gotten better, and by the time he got to high school, he was a formidable grappler for Mount Baker High School in Deming, Wash. Under the tutelage of Washington Wrestling Hall of Fame coach Ron Lepper, Calhoun earned an opportunity to wrestle in college. The freshman first attended North Idaho College in Coeur d'Alene, then after a semester, he chose to transfer to Yakima Valley Community College in Yakima, Wash., where things began to change. Calhoun suffered a shoulder injury, and he started medicating it with opiate painkillers. One prescription led to another, then another after that, and by the time his prescription had run out, the first-year student athlete was well down a path to addiction. "I limped through my first year of college and I wasn't yet sure really who I was at that point," Calhoun recalled. "I wasn't sure what I was going to do. I was only in school to wrestle, and when I kind of lost that, I kind of lost myself." He went back to Kendall, where his opiate problem graduated to heroin. Calhoun said drugs are a prominent part of the small town, and when he returned home, he fell right into its trap. With school and wrestling now in his rear-view mirror, and cognizant of his escalating issues, he saw the military as a way out. 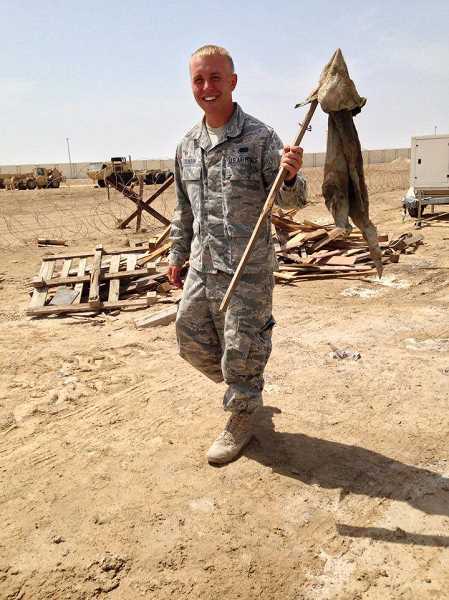 He got clean for a couple months prior, to pass the necessary entrance exams, then joined the U.S. Air Force. Calhoun struggled at first. By his own admission, he was a confident — bordering on overconfident — young man who didn't take well to authority. As a result, he spent his first couple of years repeatedly butting heads with his superiors, and he often found himself in trouble for insubordination. "The reality is that you have to keep your mouth shut and pay attention, and that was a hard time for me to get over the first year or two," Calhoun said. "I wasn't intentionally trying to be a bad soldier. It was just something I wasn't used to, and I was so stubborn." He eventually fell in line, made rank and spent his last handful of years touring the Middle East, doing tours in both Kuwait and Al Dhafra in the United Arab Emirates. At the end of his six-year military career, Calhoun returned home unaware of the turmoil that had taken root while he'd been away. In his first two weeks home, he spent the bulk of his money on his troubled kin, and he found himself homeless, living in his car. He was again without direction. He too slipped back into the habits he'd kicked more than six years ago. "I couldn't believe how far south things had gotten," said Calhoun. "I had been in contact with my mom, but when you're in that hole, you don't realize how far down you are. So when I moved home and had been out of that world for so long, you have a different perspective on it when you see it." Nonetheless, he too fell into the hole. Within weeks, he began using again, starting back on the opiates and soon thereafter heroin. Then came that June day when everything unraveled. Calhoun had stolen a dose of heroin from a family member and ingested it. Already high, he had forgotten he'd taken an OxyContin earlier, and while driving down a remote highway, he began to feel the results of his mistake. "I didn't want to go to the hospital, and I had this realization that this could kill me," he said. "I'm driving down the highway trying to keep myself awake, so I pull off the road in this old abandoned gravel pit. I have no cell service, and I accepted the fact that I was probably going to die." Calhoun figured his only shot was to stay awake. He battled, using his thoughts as his only tool for fighting off what felt like the inevitable. He thought about the mistakes he'd made — his family and friends, his old coaches, and how he'd shamed himself to them all. "I didn't stay in touch with people back home when I went in the military, so I knew when I was laying there next to my car, this would be the first and last thing they'd hear about me since high school," Calhoun said. "I knew that if I didn't get up and keep myself awake, I'd be just another one of the statistics from this community, even though I had every opportunity to get myself on the right track." Calhoun made it through, and he said that up to this point, he still had never told anyone in his life what had happened that day. But he knew he had to make a change, and when push came to shove, he leaned on wrestling. "I hadn't thought of wrestling for a long time," Calhoun said. "I weighed the options and tried to think what could keep me focused and hold me accountable, and I kept coming back to wrestling." Calhoun had a friend of a friend in Forest Grove, and he was aware of Pacific University from his short time wrestling at Yakima Valley. 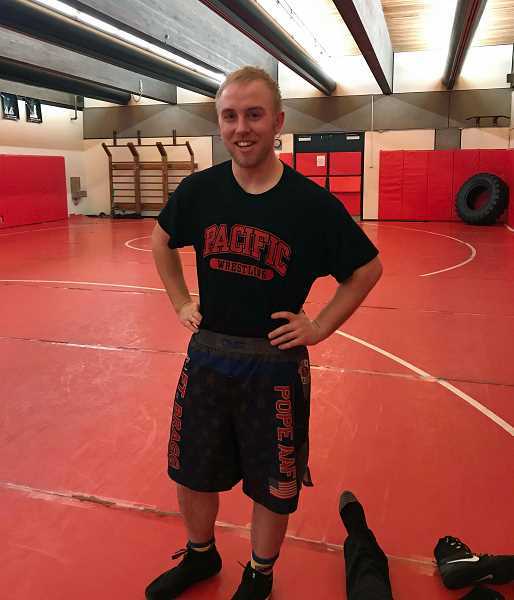 He ultimately traveled to Forest Grove, fell in love with the campus, and later called head Boxers wrestling coach Severin Walsh and sought an opportunity to try out for the team. Walsh heard his pitch and welcomed him to come out. Calhoun hadn't wrestled since college, and he was out of shape, 40 pounds overweight, and 27 years old, but he was driven — and that's all he needed. "He's had to shed about seven years of rust off since the last time he competed, but he's starting to catch up," Walsh said. "For the first portion of the season, he struggled a bit because he hadn't done it in so long, but he's shown a surprising amount of grit. I don't know too many guys who could do what he's doing and keep up." It hasn't been easy, though. Calhoun said getting back into wrestling has been one of the most difficult things he's ever done, but it's been a labor of love, he said. He's lost roughly 40 pounds since his return and is slowly getting back what his wayward years cost him on the mat. He's again acclimating himself to school, and he said he is eternally grateful for what this opportunity has afforded him. "It's opened doors to things I didn't think were possible anymore," Calhoun said. "And that's what keeps me going." Calhoun said he's been clean since that day in the gravel pit in Washington, and he feels he's left those problems in the past. But addiction is insidious, and Calhoun isn't naïve about that. "I'm confident I won't use again, but I understand that's out there," said Calhoun. "I know things won't always work out for me, but it's all progress and as long as I'm focused on moving forward, I'll be fine." And what would he say to kids in a place like the one where he grew up, one where hope is a four-letter word washed from the mouths of decades' worth of youth? "The best advice I'd give to someone is to stay focused, because if you lose focus, especially in these underprivileged places, you're done," Calhoun said. "I grew up around kids who have no concept of hope, and that's huge. ... For me, wrestling was that hope. It gave me something to work towards, but a lot of kids in communities like Kendall don't have that, and without it, you're in trouble."